To see a list of all Academic-Led Publishing Day participants and scheduled events and resources so far, as well as to learn how to get involved, visit the official event website! The inaugural Academic-Led Publishing Day is only a few weeks away and we at Scholastica are thrilled to be taking part. 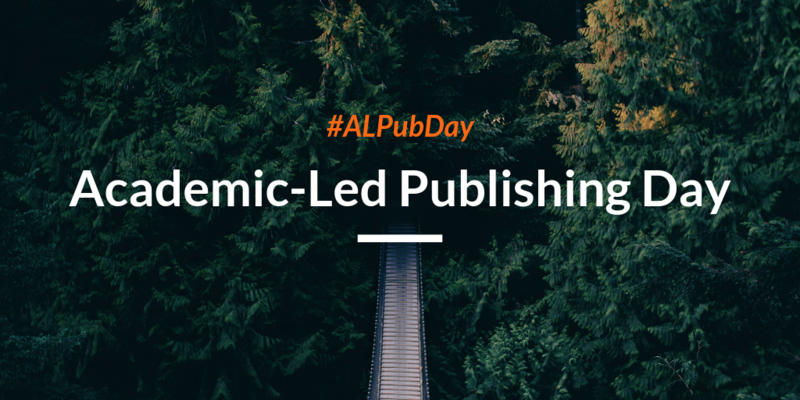 Academic-Led Publishing Day, which will take place on February 7, 2019, is a global digital event to highlight and foster discussions about how members of the scholarly community can develop and support academic-led publishing initiatives. Academic-led publishing refers to scholarly publishing initiatives wherein one or more academic organizations control decisions pertaining to copyright, distribution, and publishing infrastructure. The goal of Academic-Led Publishing Day is to create an open dialogue about academic-led publishing programs and funding models—both current and potential—and to raise awareness about the roles and capabilities of different stakeholders in this space. Similar to Open Access Week and Peer Review Week, ALPD will be a community-run event with no official “owner” or “host organization.” Rather, it is an independent initiative that all participants are co-hosting and co-promoting via a shared event website and their own channels. As ALPD gets closer, we wanted to take the time to share what you can expect from the day and how you can get involved. As a global event, ALPD will follow “the world standard” day and run from midnight to midnight Greenwich Mean Time (GMT) on February 7th. Here’s what to expect! A primary aspect of ALPD will be a collection of digital resources on the event website including blog posts, reports, worksheets, and more. The website is meant to serve as a go-to collection of high-quality resources to learn about academic-led publishing and start or build upon academic-led publishing initiatives. It will include resources for library publishers, scholarly societies and associations, as well as scholar-led publishing initiatives. We encourage you to check out the resources available so far and to keep an eye out for new additions. There will be a plethora of useful content on the website by February 7th and many opportunities to discuss those resources and academic-led publishing models, best practices, and lessons learned. Academy takes on publishing: OASPA Webinar in support of Academic Led Publishing Day (3 PM GMT) - This webinar presented by the Open Access Scholarly Publishers Association (OASPA) will showcase excellence in academic-led publishing, with a focus on open access and open science. The webinar will be co-chaired by Catriona MacCallum, Director of Open Science at Hindawi and Claire Redhead, the Executive Director of OASPA. It will feature the following guests: Dr Paul Ayris Pro-Vice-Provost (UCL Library Services), Kathleen Shearer, Executive Director of the Confederation of Open Access Repositories (COAR) and Charles Watkinson, Director of University of Michigan Press and Associate University Librarian for Publishing at University of Michigan Library. How to Start or Flip an Open Access Journal: Publishers and editors share their stories (on-demand) - This webinar presented by Scholastica overviews the benefits of academic-led publishing as well as the ins and outs of running new or flipped academic-led OA journals. The webinar features the following guest speakers: Jaclyn Sipovic, Digital Publishing Coordinator at Michigan Publishing; Sean Guynes, Journals Coordinator at Michigan Publishing; Hugh Thomas, Co Editor-in-Chief of Algebraic Combinatorics. Coming soon: Webinar from Knowledge Unlatched - Look out for the details of a webinar hosted by Knowledge Unlatched on consortia funding models for academic-led publishing! There are many ways for organizations and individuals to take part in ALPD. To take part in the day, look for announcements on the official event website and follow event discussions on social media via the hashtag #ALPubDay. If you work with an organization that would like to submit a blog post, online resource, or a digital/in-person event related to academic-led publishing to be included on the shared event website, you can sign on as a participating organization by filling out this Google form. Follow the official event hashtag #ALPubDay and join in conversations on social media outlets including Facebook and Twitter. Join the Public Forum for scholarly publishing reform towards Fair Open Access and take part in ongoing discussions there related to academic-led OA publishing. Look for Take Action items on the ALPD website and get involved in opportunities relevant to you. We hope to see you at the first official Academic-Led Publishing Day! We've rebuilt publishing from the ground up to make it even more efficient for your journal, with new functionality and an improved design. Scholastica, American Journal Experts, and Research Square announce the release of a free training course for journal editors on best practices for managing authors throughout peer review and production.